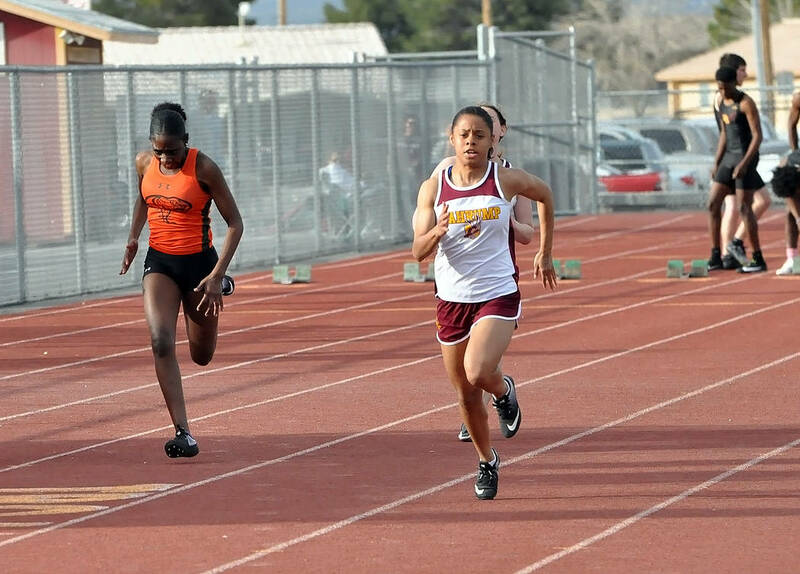 Horace Langford Jr./Pahrump Valley Times Pahrump Valley's Jazmyne Turner has qualified for the Class 3A Southern Regional Championship in the 100 meters after running it in 13.58 seconds Friday, March 22, at the Silver State Invitational at Coronado High School in Henderson. “We have explained to our athletes that the important time to peak is in May, for the postseason,” Schmidt said. The Trojans competed in two very different arenas over the past week, first a weekday meet at home that included Del Sol, Mojave and Beatty, and then a very competitive Silver State Invitational at Coronado High School in Henderson. Junior Jazmyne Turner’s time of 13.58 seconds was only good for 24th place at Coronado, but it was enough to lock up her spot in the Class 3A Southern Regional Championships in May. On the boys side, senior Jacob Cipollini and juniors Grant Odegard and Michael Sonerholm each have qualified in the 1,600, with Cipollini also qualifying in the 3,200, Schmidt said. Most of the 23 teams to score points at the Silver State Invitational were Class 4A schools, and the Pahrump Valley boys finished 15th with 10.5 points and the girls Trojans wound up not scoring. The top performances for the Trojans came in the boys high jump, where senior Chance Farnsworth finished second at 6 feet and classmate Ethan Whittle tied for sixth at 5-8. Several Trojans just missed on top-10 performances. For the boys, Odegard’s 11-6 was good for a tie for 11th in the pole vault, while the 4 x 200 relay of Isaak Cruz, Whittle, Kenny Delker and Antonio Margiotta finished 11th in 1:43.06. The 4 x 100 of Whittle, Dee Brown, Delker and Margiotta took 12th in 50.54. For the girls, junior Kylie Stritenberger finished 11th in the shot put at 30-7.75, while junior Destany Korschinowski’s 28-9 was good for 14th. Sophomore Taylor Williamson tied for 12th in the pole vault at 7-0. “From our midweek there were a couple girls that qualified in shot and discus,” said Schmidt, citing Korschinowski, Stritenberger, Makani Araujo and Kate Daffer, while senior Elaina Dattilio qualified in the long jump. Skyler Lauver went 5-for-5 with a triple, three RBIs and two runs on Monday to lead Pahrump Valley to a 10-8 win at Boulder City. Allyson Rily was 2-for-4 with a home run, three runs and two RBIs for the Trojans, who took a 9-4 lead with a five-run fifth inning and held on despite a four-run sixth for the Pirates. Samantha Riding also drove in two runs for the Trojans. Ashleigh Murphy went five innings and Rily pitched the final two for the Trojans, who outhit the Pirates 13-6. On Friday, Deeanna Egan hit an RBI triple, Kareena Nelson doubled in a run in the Trojans’ 13-3 loss to Coronado in five innings. Riding also doubled for Pahrump Valley, which scored all of its runs in the top of the first. The Cougars pounded out 16 hits to improve to 10-6. Coronado is ranked third in Class 4A South by Nevada Preps. Cyle Havel, Chase McDaniel and Joey Koenig combined on a shutout as Pahrump Valley blanked Moapa Valley 3-0 on Monday in Overton. Koenig went 2-for-4 with a triple and two runs scored, while McDaniel was 1-for-3 with two RBIs for the Trojans, who shut out the Pirates (7-3) despite surrendering six hit and six walks and committing three errors and getting only five hits. Jalen Denton and Zach Trieb had the other hits for Pahrump Valley (7-3). On Friday, Willie Lucas tripled and scored a run and Jalen Denton went 1-for-3 with an RBI and a run scored in Pahrump Valley’s 7-2 loss to Coronado. Reace Millette, Koenig and McDaniel had the other hits for the Trojans, who trailed 7-0 before scoring twice in the top of the seventh. Coronado (6-6) outhit Pahrump Valley 11-5. Koby Lindberg carded an 84 and Kasey Dilger was right behind with an 85 as Pahrump Valley cruised to an easy win in a Sunset League match hosted by Western on March 20 at Las Vegas Golf Club. The Trojans finished with a 64-over 352, well ahead of Western (414) and Del Sol (461). Also scoring for the Trojans were Trevyn Wombaker (91) and Kasen Moore (92). Three Trojans recorded birdies on the par-72 course: Lindberg and Wombaker on No. 18 and Ian Kingsley on the 15th hole. On Monday at Highland Falls, Dilger led the Trojans with an 82 but Pahrump Valley lost to Palo Verde 310-358. All four of Palo Verde’s scoring golfers bested each of Pahrump Valley’s. Also scoring for the Trojans were Kingsley (89), Lindberg (93) and Caleb Sproul (94).